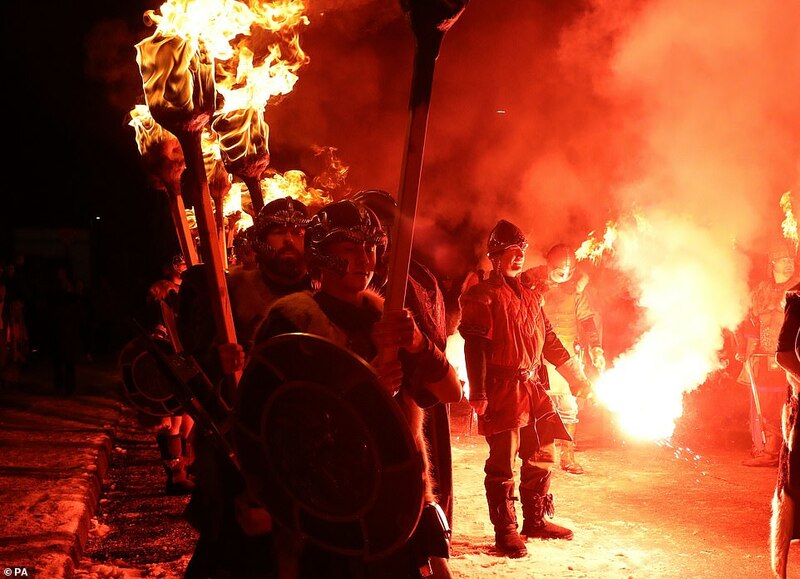 Thousands of people descended on Shetland dressed in Norse attire for the world-famous Up Helly Aa fire festival. 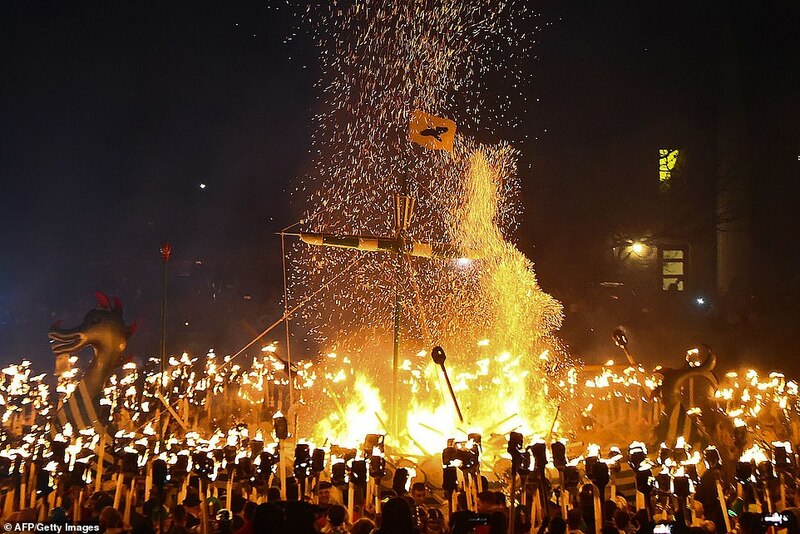 The spectacle, which attracts visitors from around the globe, takes place in Lerwick on the last Tuesday of January each year. 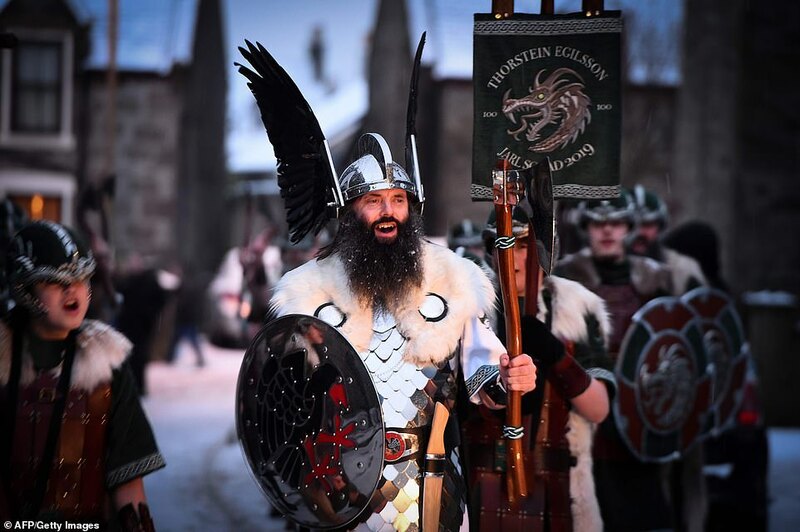 People dressed as Vikings marched through the streets of the town to recreate its ancient Viking past, in a tradition dating back to the 19th century. 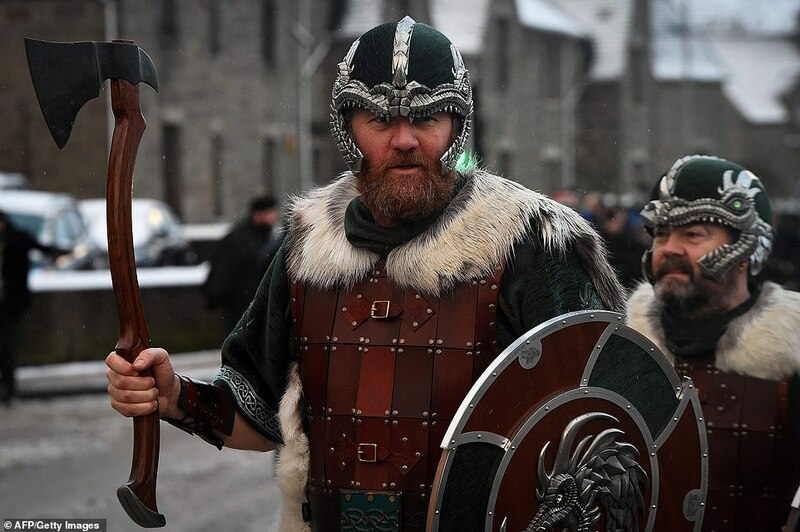 Today people dressed as Vikings marched through the streets of the town to recreate its ancient Viking past, in a tradition dating back to the 19th century. 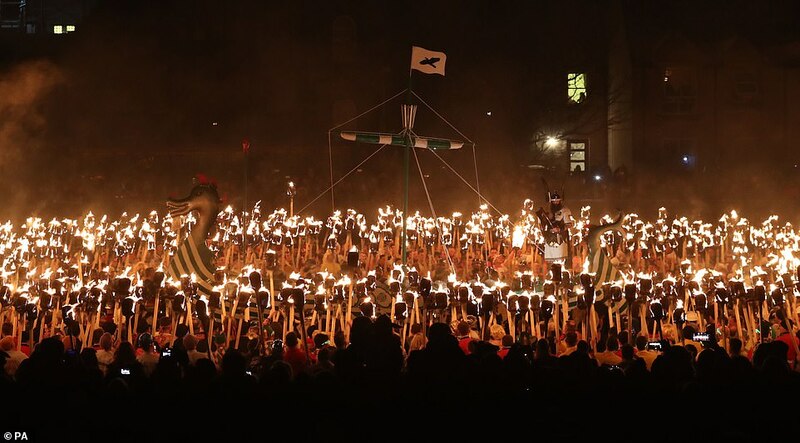 And tonight hundreds with flaming torches took to the streets before immolating a hand-made longboat in a night-time ceremony. 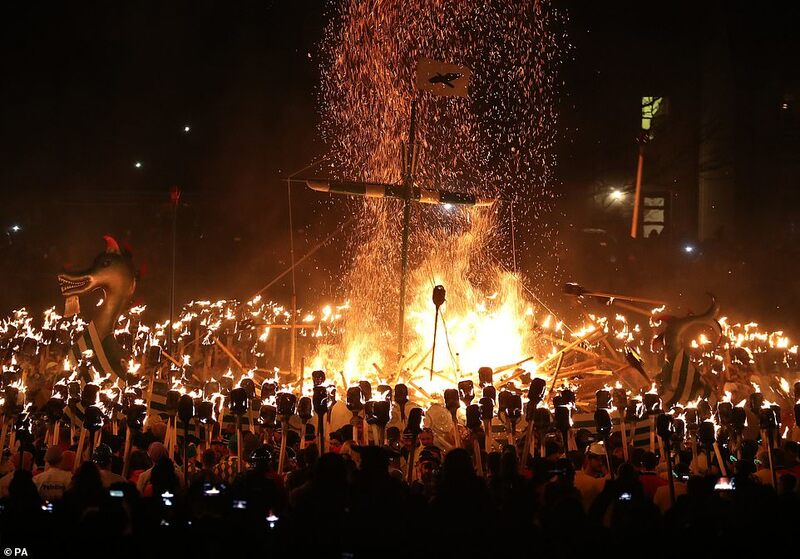 The ceremony culminated in the evening with a galley being set alight and fireworks high above the gathered crowds celebrating the annual tradition. 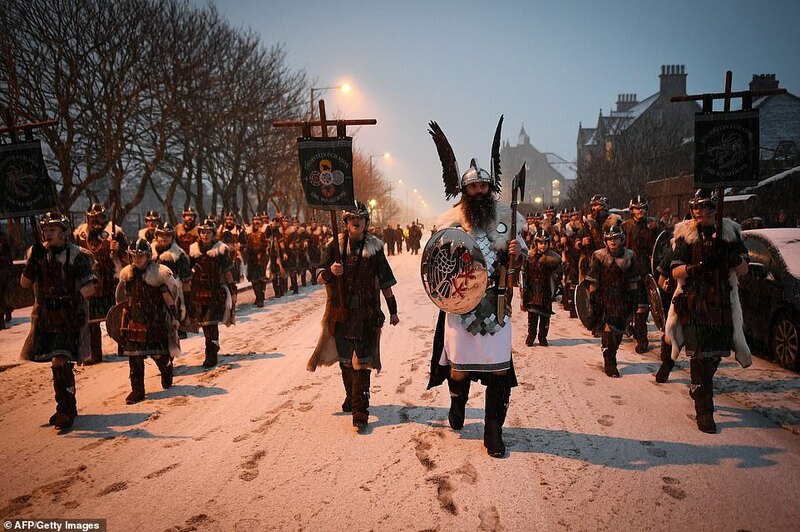 John Nicolson, chief guizer this year, led the men through the streets of the Shetland port towards the replica longboat. 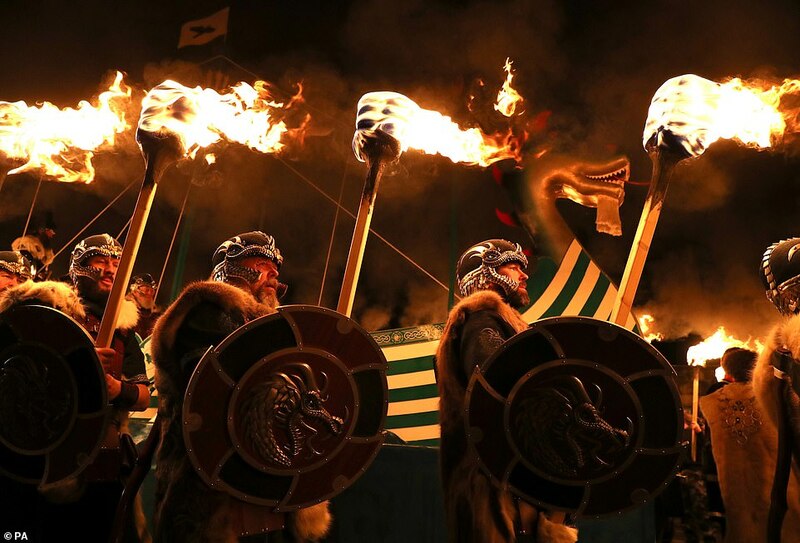 This year, it was decorated in the distinctive green and white hoops of Celtic at Mr Nicolson's behest, and without qualm from his brother David - the former Guizer Jarl and Rangers fan joked he would 'take great delight in seeing it burn'. 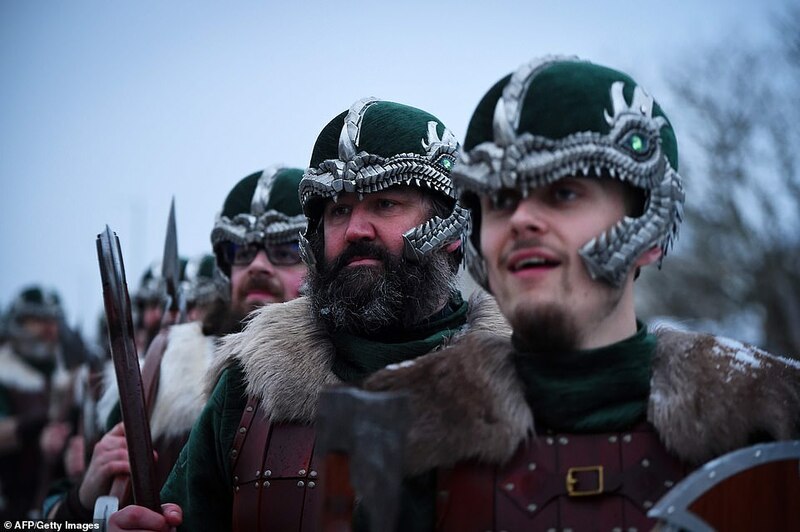 Dozens of adults and children paraded through the town in matching green helmets, tunics and carrying axes this afternoon. 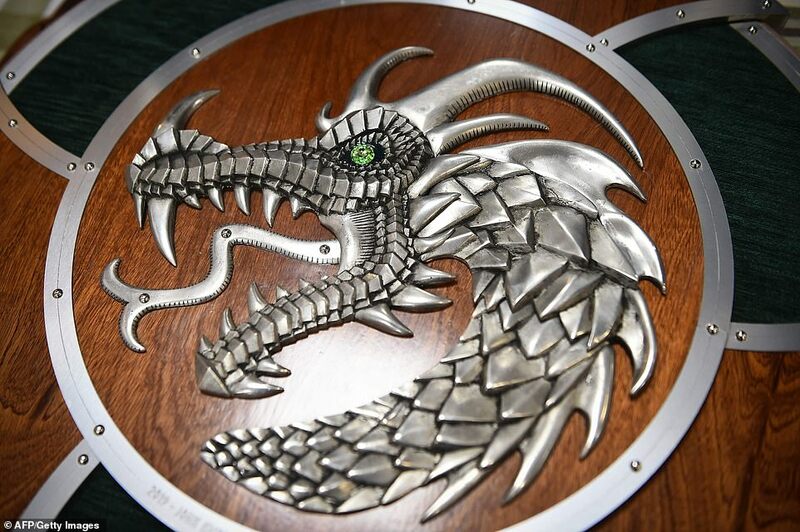 Each of the apparent Vikings also held a green and brown shield bearing the image of a dragon in silver. 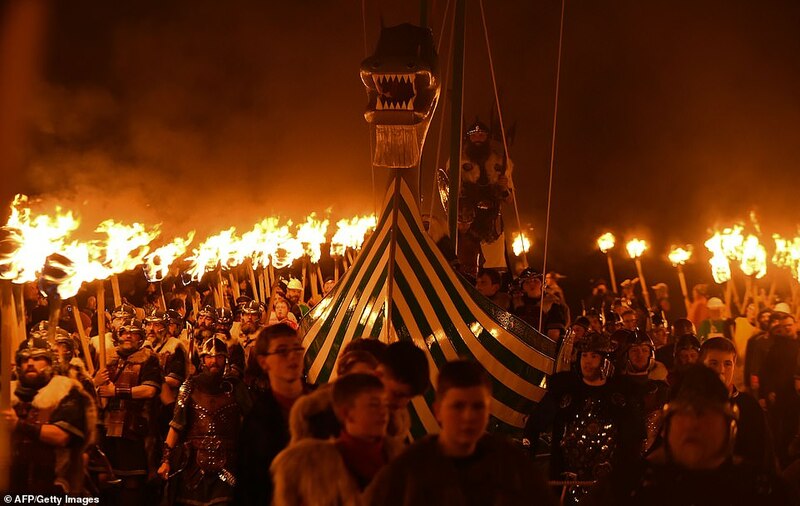 The procession is led by the Guizer Jarl, or chief guizer, and it culminates in a replica longboat being set alight. 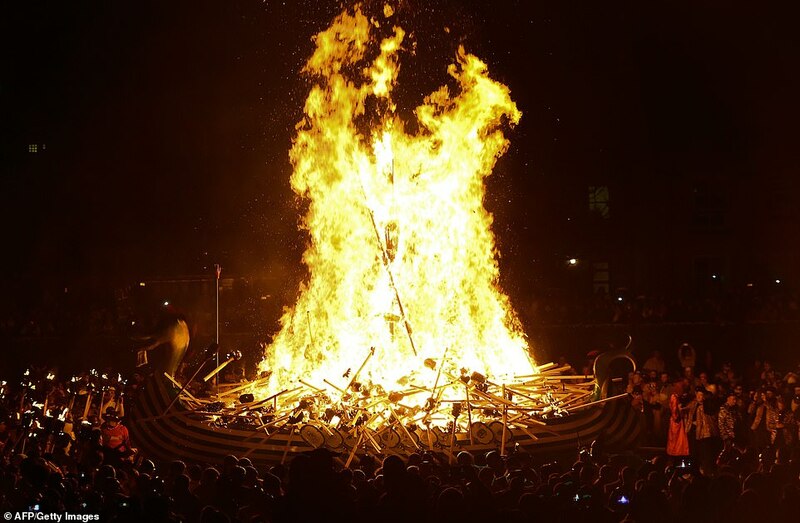 Volunteers are responsible for the building of the galley boat and the production of more than 1,000 torches. 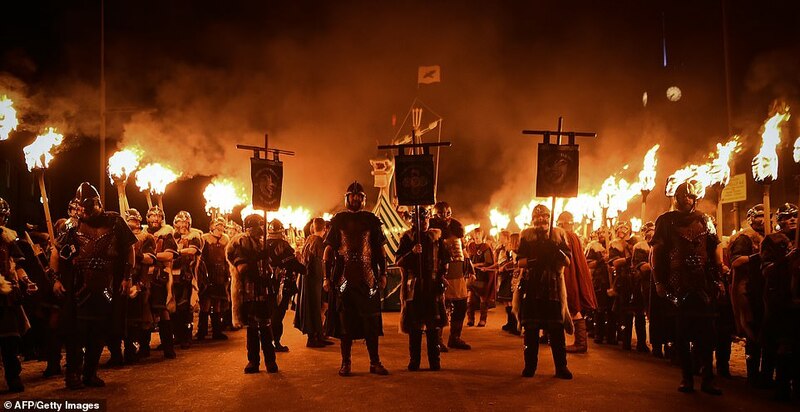 Those taking part in the festival spend the night visiting a host of celebrations in halls around the town. Shetland and neighbouring Orkney were ruled by the Norse for about 500 years until they became part of Scotland in 1468. 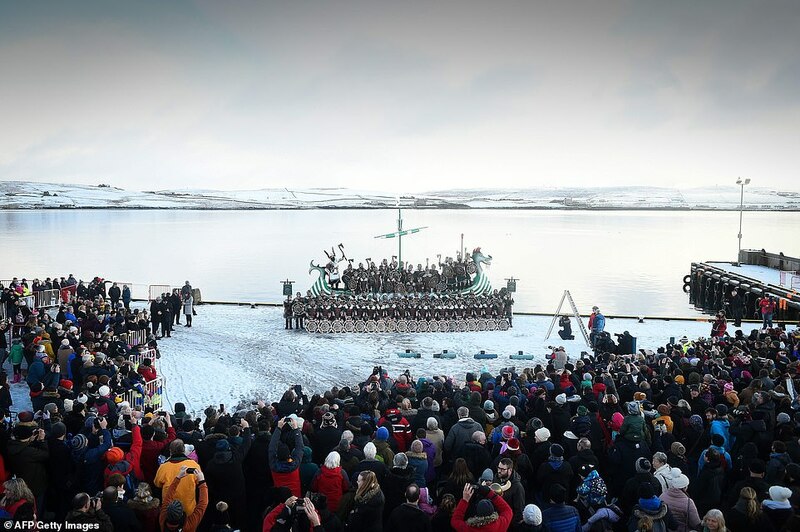 The festival stems from the 1880s when a group of young local men wanted to put new ideas into Shetland's Christmas celebrations. 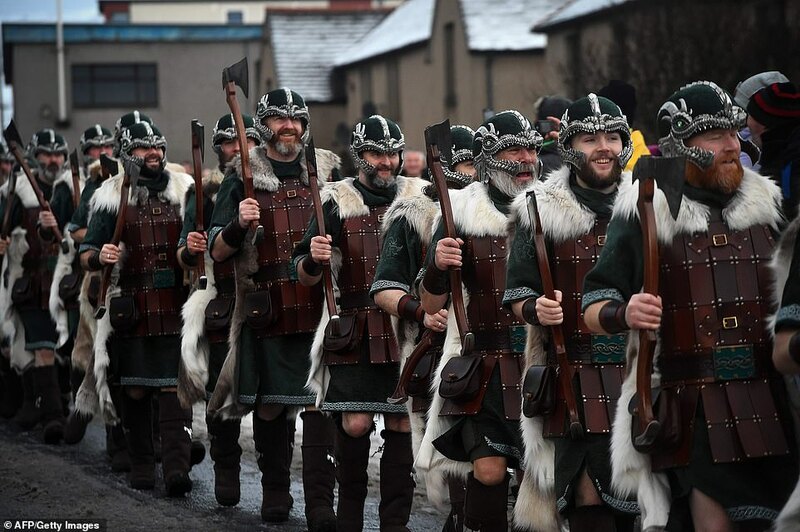 At the time, squads of young men would drag barrels of burning tar through town on sledges, making mischief. But as the event became more raucous year on year concerns over public safety grew. 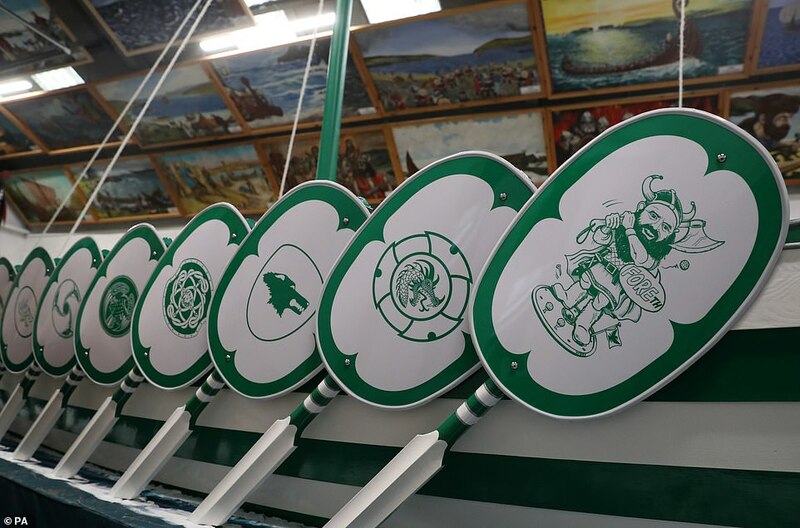 This led to a change in the celebrations, and saw town chiefs draw inspiration from the islands' Viking history. 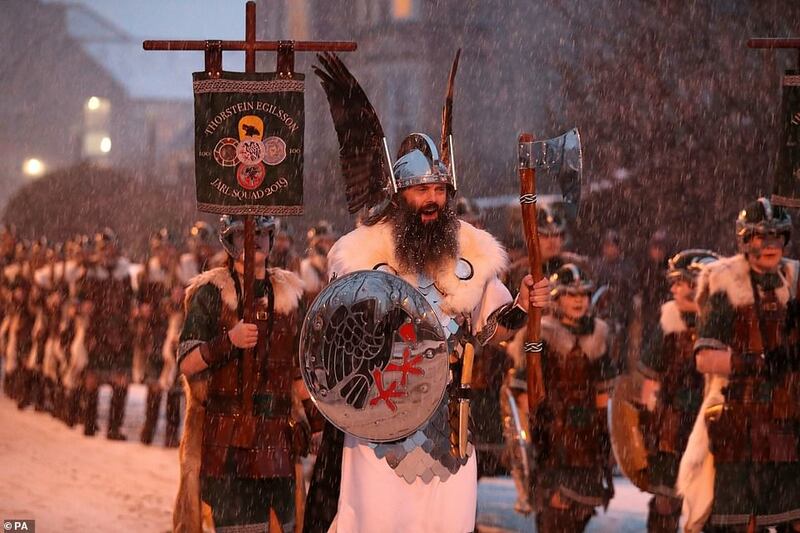 The honorary role of the 'Jarl' was introduced to the festival in the early twentieth century. 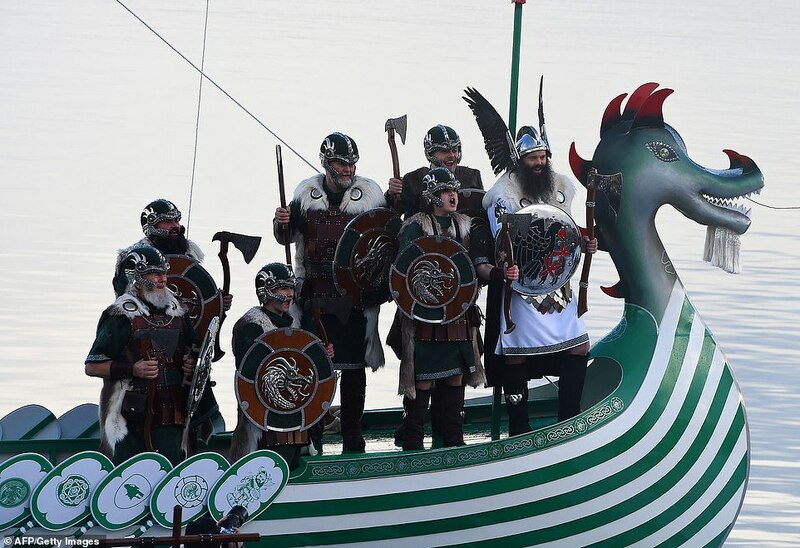 Viking invasions of the Shetland Islands, in the North Atlantic, began in around 800 AD and, before long, Shetland became the northernmost third of a Norse earldom. 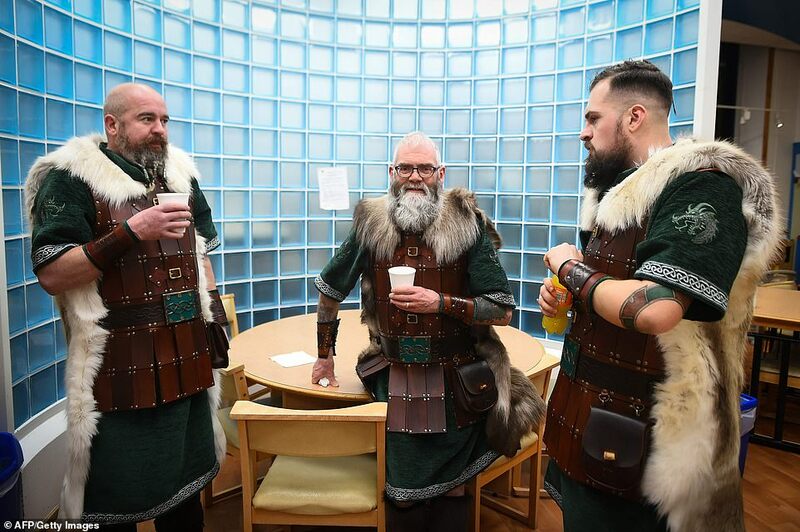 It is believed the Norse first arrived in the two islands when Harald Fairhair, the first King of Norway, took control of the Scandinavian country in around 872 AD. When he seized control of the land, many of his enemies fled - some to Orkney and some to Shetland. 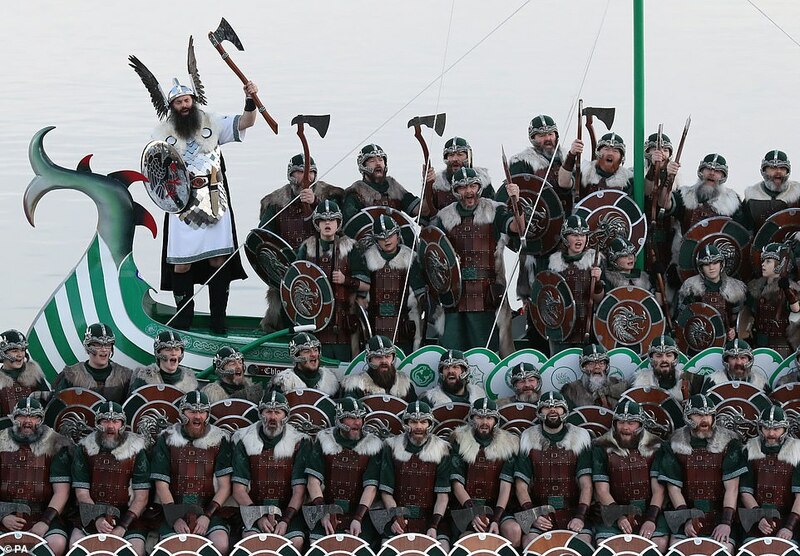 But these Vikings then continued to raid north, prompting Harald himself to raise a large fleet and sail to the islands just a few years later. He took control in around 875 AD - and handed leadership of the two islands to Rognvald Eysteinsson as an earldom in reparation for his two sons being killed in battle in Scotland. Norse control at one point extended as far as the Scottish west coast and the Hebrides, but it was confined to Orkney and Shetland during the battle at Largs in 1263. 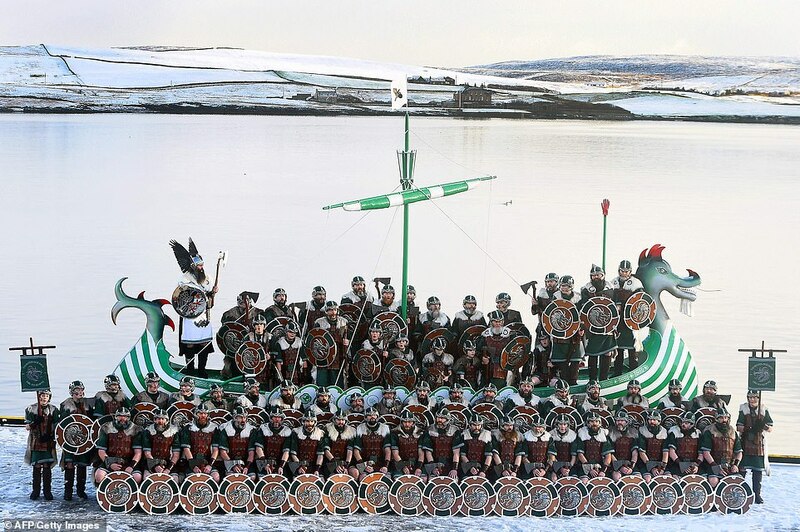 King Harald of Norway's fleet gathered at 'Breideyarsund' - believed to be the Bressay Sound - before the battle. 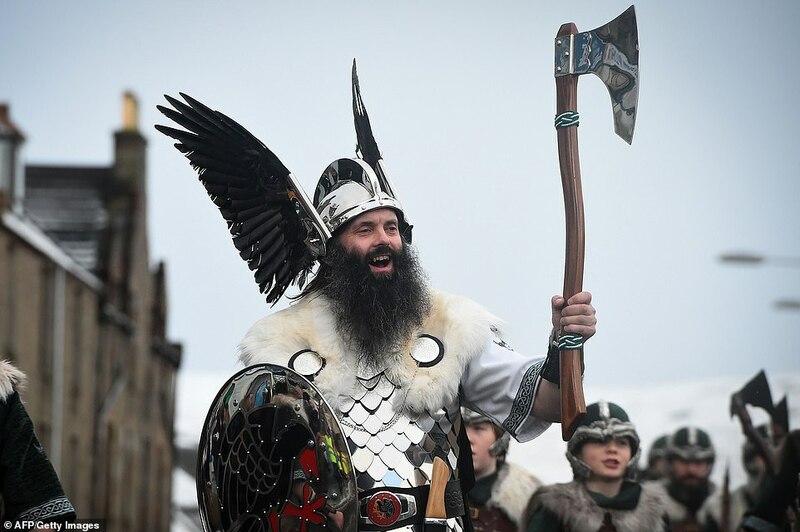 It's unclear what happened to the indigenous Pictish people who previously populated the isles - but direct Norse rule continued in Shetland until around 1468. It ended as the result of a marriage treaty between James III of Scotland and Margaret, a Danish princess. Orkeny and Shetland were given back to Scotland when the Danish struggled to find the funds to pay for her dowry. 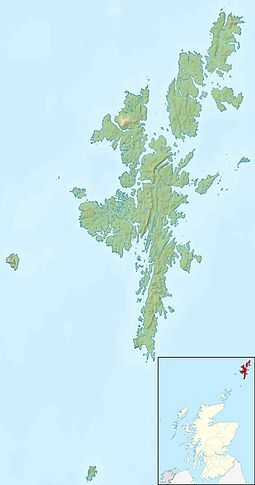 Shetland eventually became a part of Scotland in 1471. The Orkneyinga saga, which tells a historical narrative of the Orkney and Shetland Islands, includes references to this lengthy period of Norse control. Good to see that British shipyards are still busy. 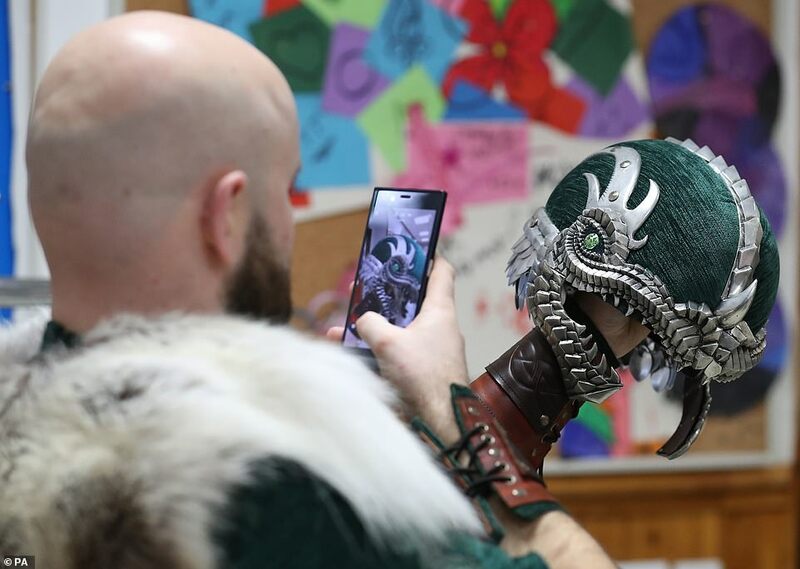 just wait until they get the 3D printers.